Most people know about Yellowstone’s geysers; Old Faithful, the most famous, shoots steaming spray 100 to 180 feet into the air with regularity. 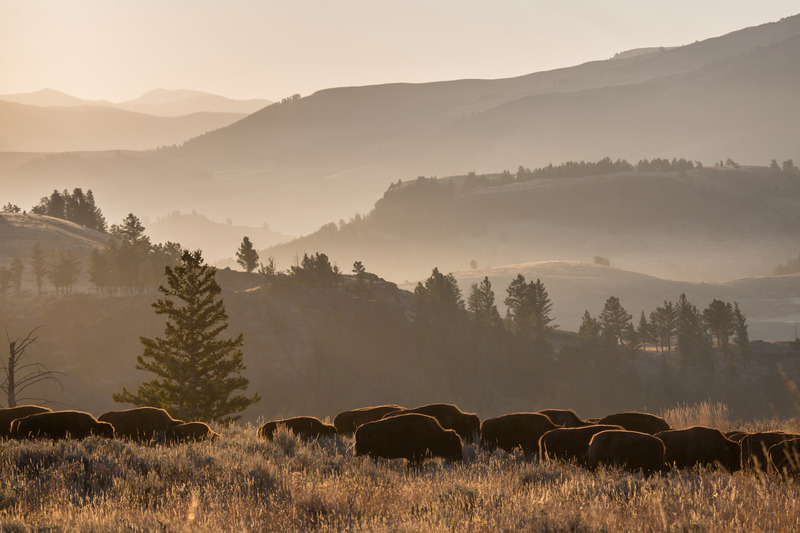 But within Yellowstone’s nearly 3,500 square miles, you can hike forests, take a boat trip, admire a canyon, ride horseback, travel by covered wagon and stagecoach plus look out your car window to see bison, moose, elk, and bighorn sheep. That makes it a perfect family destination. Yellowstone National Park is very popular. It’s wise to reserve lodging, guided tours, and dinners, where possible, in advance. Lodging and tours can be booked as early as May 1 the year prior. All sit-down restaurants offer kids’ menus. To see Yellowstone’s iconic attraction before the day trippers arrive, be at Old Faithful before 9 a.m. The geyser erupts every 90 minutes, give or take 10 minutes. 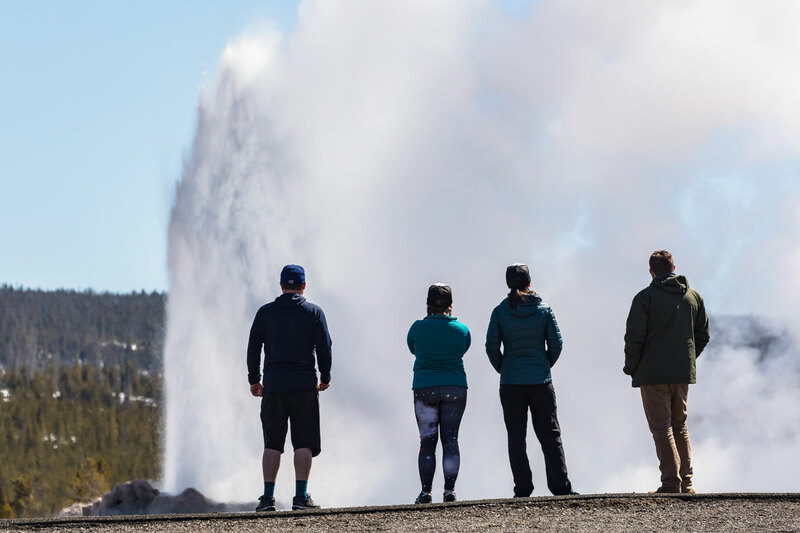 At the Old Faithful Visitor Education Center, peruse exhibits that show how geology and geothermal forces create geysers and hot springs. Check for ranger-led activities and pick up a Junior Ranger booklet (for a fee) for your kids and for you. Parents and children can achieve junior ranger status by hiking a trail, attending a ranger-led activity, and completing the brochure’s activities. Your reward: knowledge of the park and a Junior Ranger patch. Walk the Upper Geyser trail or rent bicycles at the Old Faithful Snow Lodge and pedal to Morning Glory Pool or the Lone Star geyser. Instead of following the many day visitors to the Lower Geyser Basin, head in the opposite direction to Yellowstone Lake. After lunch at Lake Lodge Cafeteria or Lake Hotel Dining Room, choose your lake adventure at the marina — a scenic one-hour cruise, a guided fishing/sightseeing boat charter, or time in your own rented motor or rowboat. Afterwards, head back to the Old Faithful area. Get a feel for the historic Old Faithful Inn, with its multi-story log lobby, by walking through it. Browse the gift shop and at the Bear Paw Deli, get an ice cream cone that you can eat on the Inn’s deck, keeping your eye on Old Faithful. Before (or after) dinner attend a ranger-led activity (when scheduled) at the Visitors Center. Dine at the Old Faithful Inn (reserve ahead) or the more casual Old Faithful Lodge Cafeteria, the only restaurant with a view of Old Faithful. Grab muffins, bagels, and breakfast sandwiches at the Old Faithful Lodge Bakery before checking out of your Old Faithful area lodging. Drive to what’s known as the Grand Canyon of Yellowstone, whose cliffs captivate with bands of pink, yellow, and orange stone. On a hike of the relatively easy 1-mile South Rim Trail beginning at the beautiful Upper Falls, the final reward is the sight of the 308-foot Lower Falls plummeting over the ridge. After lunch at the Canyon Cafeteria, Dining Room, or Snack Shop, you have three options. Choice 1: You can saddle-up at Canyon Lodge Corral for a guided horseback ride. (Riders must be at least 8 years old and 48 inches tall and weigh less than 240 lbs. Reserve ahead). If you have older kids, you can follow the ride with a hike on the Mount Washburn Trail, about 4.8 miles north of Canyon. The trail, which gains 1,400 feet in elevation in 3 miles, offers great views. 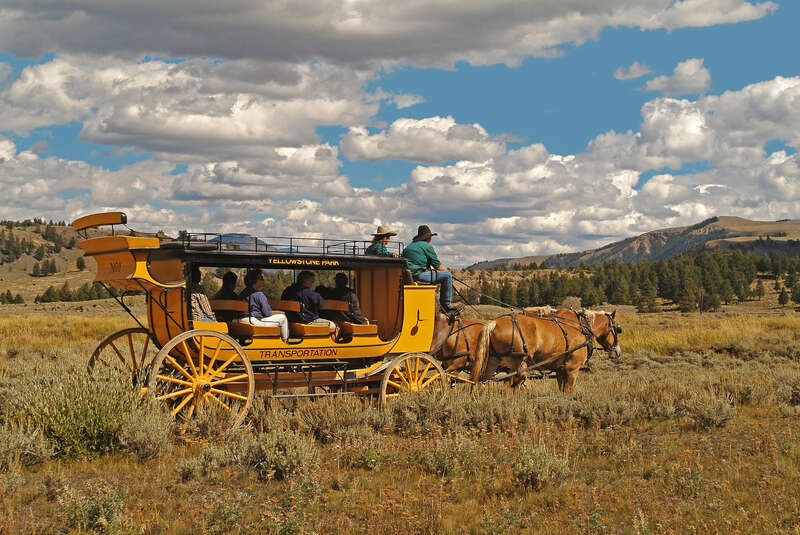 Choice 2: Do the horseback ride at Canyon Ranch and afterward head 19 miles north to board a stagecoach at Roosevelt Lodge, (reserve ahead), a replica of the Tally-ho versions, for a fun ride with western lore. On the drive to the Tower-Roosevelt area, look for the deer, bison, and elk that favor this region. Choice 3: Do the horseback ride and afterward head 19 miles north to board a covered wagon at Roosevelt Lodge for the Old West Dinner Cookout, among the most popular organized activities in the park. (Reserve ahead.) Cowboy lore and songs accompany your steak and baked beans meal. Drive to Mammoth Hot Springs to check into your accommodations. At the Visitor Center learn about the area’s history and find out about ranger-led tours. Early in the morning (6:15 a.m.) board a historic Yellow Bus at Mammoth Hotel, a 13-seat 1930’s vintage bus for the Wake Up to Wildlife tour (reserve ahead). Yes, it’s early, but animals are most active in the early morning and the evening. The Lamar Valley is not only rich in wildlife, but the open vistas afford prime viewing. The little ones can sleep and older kids will be happy when they spot elk and bison grazing on the hillsides and eagles flying overhead. After lunch at the Mammoth Hot Springs Terrace Grill or Dining Room, take a ranger-led tour, if scheduled. Drive the Upper Terrace Loop to get a broad sense of the formations and also walk the boardwalks to see the terraces up close, formed when waters from the hot springs pass through the limestone and leave calcium carbonate that builds into the unusual shaped terraces. Stop at the Visitors Center to receive your Junior Ranger badges (if all the requirements were completed). En route to exiting the park at either the West or South entrance, stop at Fountain Paint Pot, the only area that has all four types of geothermal features — geysers, hot springs, steam vents (fumaroles), and mudpots. The algae and bacteria have turned some of the bubbling mud to pastel pinks. Keep watch for your last look at the bison, elk, and other critters of Yellowstone as you depart.